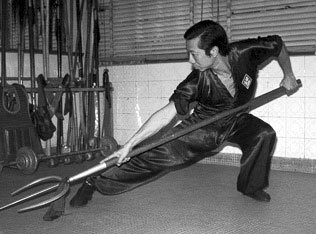 Lau ga kuan - basic staff It is a long "one head" pole training set and is the first taught long weapon. As the Lau ga kuen set comes from the Mok family and it's founder Mok ching kiu, but, as the time passed, it absorbed the characteristics of Hung Kar. This set with the Lau ga kuen and the Tan do are includes the basic training of the traditional Hung Kar. It is very powerful and effective weapon that develops special strength on the back, forearms and hips. Ng Lung pa kwa kuan - eight directions staff It is the famous "eight diagrams long pole" and have its roots to the legendary "shaolin long pole technique" from the 700 A.C. 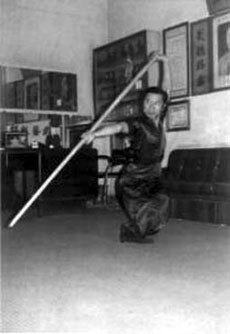 It first was taught to Lok ah chai from the abbot Che Seen and then sifu Lok passed it to Wong kai ying; who in his turn developed the set and was recognized as the king of the long pole in Kwantong province. Today the set's tradition carried by the style's traditional heir. Hang che pang - big monkey's staff It is a "two headed pole" training set. This pole has its height till to the head and the same width in all of its length. It uses deferent handhold and techniques from the "long pole" and also a lot of low stances. Those characteristics make it to combine perfectly with the Pa kwa kuan applications. Moi fa ying cheong - plum blossom spear. As the Tan do kuen the set of plum blossom spear have its origins to the North. It is a very beautiful set and presents with Hung Kar characteristics all the fundamental techniques that accompanied this kind of weapon. Moi fa ying cheong - plum blossom spear As the Tan do kuen the set of plum blossom spear have its origins to the North. It is a very beautiful set and presents with Hung Kar characteristics all the fundamental techniques that accompanied this kind of weapon. Seong long do - dragon's double broadsword This set is one of the most impressive sets of the system. Short quick steps, continues change of the directions to the eight corners, high level close to the body broadsword techniques, low stances and various uses of the swords make the performer to seem as a dragon of furry or a wind spout sweeping the place around. Chao ga seong do - bat's southern double sword It is a beautiful "southern double sword" set that dominates from the fast motion and the quick change of its techniques, as the bat's fly. 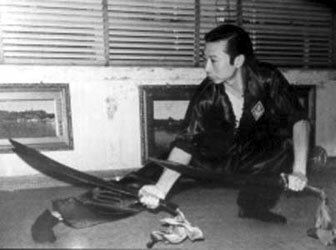 Tai hang seong do - big monkey's southern double sword, or; Koi chong do - Koi chong's swords The Tai hang seong do is one of the important sets of the system. Was Lam Sai Wing's favorite weapon set. He gave his father's name to the set, Koi Chong, and so the set has two names today. It is said that he even refused to teach the set to his daughter and so that she couldn't teach it to her husband and would stay in the family. The set focused mainly to the low stances and practical applications. Ng jie bien - iron single whip. It is a typical traditional "five (5) peaces iron whip" set and contains most of this weapon's famous and dangerous techniques. Seong ng jie bien - iron double whip. This set certainly is more difficult then "Tan pin" and its techniques suit to the double use of the weapon. 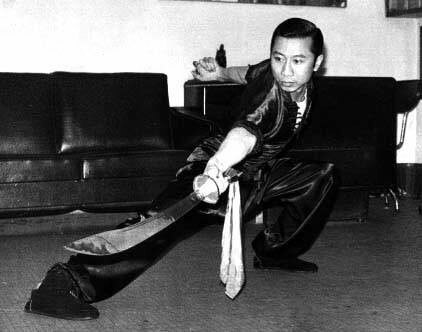 Chung chao tai do - gen. Kwan's long handled broadsword. General Kwan's do is one of the oldest traditional Chinese weapons and the parent of all the long handled broadswords. Hung Kar's Kwan do training set is of the most traditional routines and includes folklore techniques such as general Kwan keeps his bear, ridding his horse, saluting the people etc. It is an advanced training set and needs special strength and technique. Yiu ka tai paa The Tai paa was weapon or tool for the old hunters who used to hunt wild quarries. Hung Kar's Tai paa have its origins in Yiu ka, a place located in the central China, from witch it takes the name. Is one of the typical traditional weapons of the system. Moi fa siu tiu - plum blossom eight rings long handled broadsword Siu tiu's technique is similar to Kwan do's, but its technique accommodates to the shorter size of handle and longer sizes of sword. The sound of the rings, on the sword and the end of the handle scared the enemy at the old times and today gives the attribute of this weapon.